Picking the right garage cabinet style can be a difficult choice, but Ohio Garage Interiors has the quantity and quality to get you exactly what you need. Ohio Garage Interiors will give you a cabinetry with a long lifespan and visual appeal. They also make cleaning extremely easy. Their wall-mounted cabinets protect again nesting pests and damaging moisture. Furthermore, these cabinets will withstand any warping, sagging or delamination, meaning there is one less worry on your shoulders. Ohio Garage Interiors designs cabinetry with style and durability. These cabinets will take your garage to a new level of majesty and aesthetic. They offer construction with strength and longevity with dimensions up to 48 inches wide among many other features. This includes adjustable 1″ thick shelves, 1′ thick top and bottom, heavy-duty hardware, and off-the-floor design with a clean white interior. In addition, Ohio Garage Interiors also offers installation of hardware and counter tops for better aesthetic and utility. 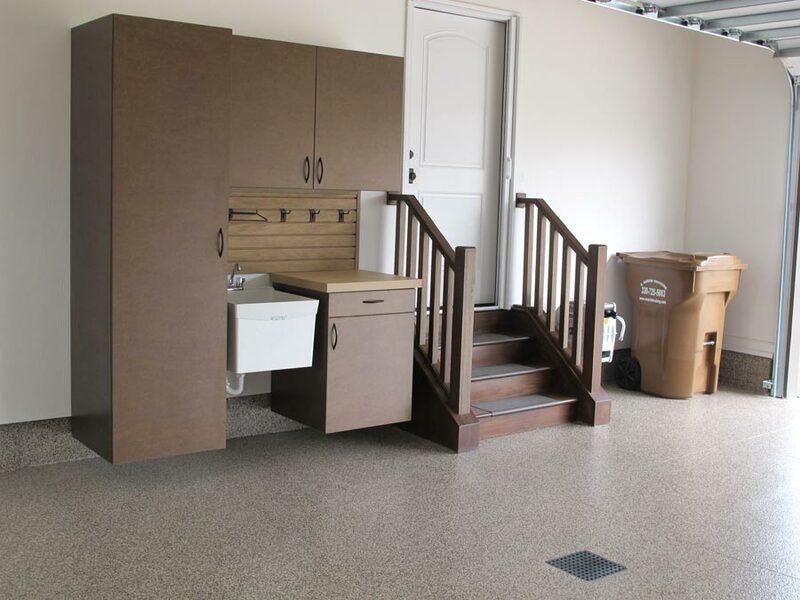 Whether you need a butcher block counter top,stainless steel handles or a sink, Ohio Garage Interiors will give you exactly what you need to give your garage a truly complete look. The selection of hardware and edging they provide will complement almost any garage design. Giving the customer options to suit their needs is something Ohio Garage Interiors focuses on. Along with all the utility their cabinetry offers, they also provide a multitude of different colors and wood grains. Customers can choose a range of styles for their garage cabinets. Ohio Garage Interiors offers wood grains like mahogany and light cherry. They also offer solid color finishes, or for a more modern look, metallic style finishes. Customers of Ohio Garage Interiors can also opt in for a plethora of custom design choices. They offer custom options and add-ons such as trash receptacles, lighting, sinks and even lockers if you so choose. There storage options are also allow much freedom of choice, going so far to allow for small bars or a space for a television. Ohio Garage Interiors will make you a garage cabinet set that will transform your garage. They work to ensure your garage will become a comfortable extension of your home you can feel proud of. Those in a need of a garage enhancement should not hesitate to contact Ohio Garage Interiors. After they are finished installing your new cabinetry, you will be looking at more than a brand new garage. You will be looking at a new home.